Why Are Paleontologists Suing the Trump Administration? Why is the Trump administration rethinking the scope of national monuments? Use our study guide to find out. Teachers, scroll down for a quick list of key resources in our Teachers Toolkit, including a link to today’s MapMaker Interactive map. The Trump administration lifted strict protections from about 85% of the 61,000-hectare Bears Ears National Monument. The administration cut in half the 760,000-hectare Grand Staircase-Escalante Monument. What other monuments are being reviewed? Use today’s MapMaker Interactive map to identify the monuments that have been cut, and those under review. Why has President Trump reduced the size of the Bears Ears and Grand Staircase-Escalante national monuments? Read the presidential proclamation about Bears Ears for some help. Supporters of the cuts hope to “usher in a bright new future of wonder and wealth” with increased opportunities for economic development. Removal of land from a national monument opens possibilities for investment in extractive activities, such as drilling and mining. 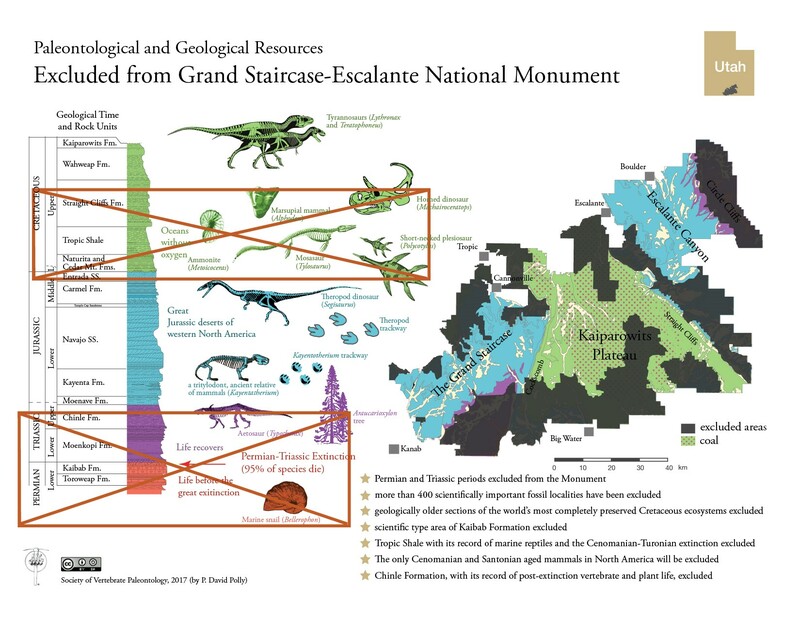 Designation of Grand Staircase-Escalante in 1996, for instance, stopped plans for a coal mining project. Who is suing the federal government to challenge cuts to the monuments? conservationists. Organizations including the Wilderness Society, National Resources Defense Council, Earthjustice, the Sierra Club, the Southern Utah Wilderness Alliance, the Grand Canyon Trust, and the Great Old Broads for Wilderness have filed a lawsuit to force the release of Freedom of Information Act requests for information about proposed cuts to national monuments. scientists. The Society of Vertebrate Paleontology (SVP) is suing to block the cuts. In addition, more than 100 scholars signed a letter arguing that only Congress can shrink a monument. What legal argument unites the concerns of all these groups legally opposing the cuts? The groups all say the executive branch does not have the legal authority to reduce the size of an existing monument. Why are the paleontologists of the Society of Vertebrate Paleontology in particular concerned about cuts to the two national monuments? Read through their statement for some help. Both areas are huge repositories of fossils, and part of the SVP’s mission is to preserve vertebrate fossils. “[V]ertebrate fossils are rare. Often a vertebrate fossil is one of its kind. 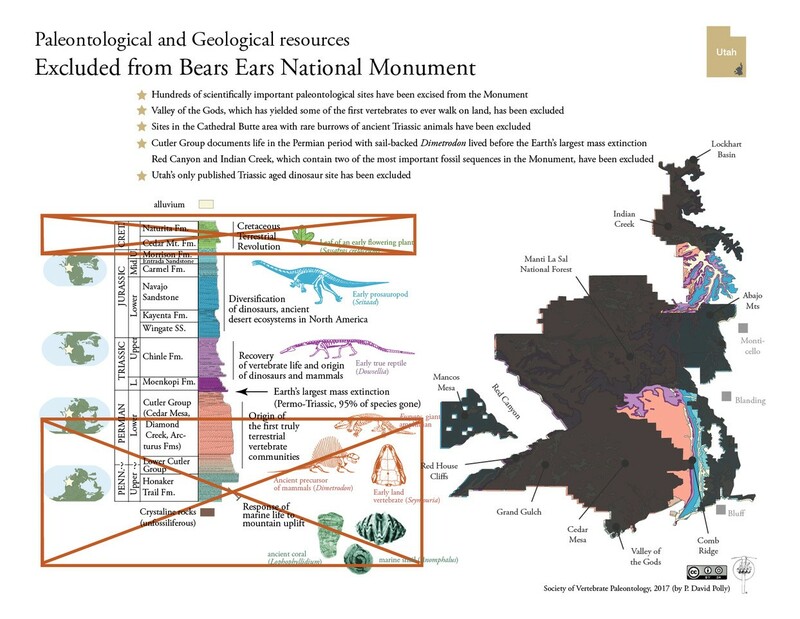 But even when it’s not one of its kind, paleontologists need to know things about ranges of variation, geographic distributions of species, and so on.” Protections afforded by national monuments preserve both the fossils and the rock formations from which they are extracted. How does removing lands from national monument designation threaten paleontological sites? “First, in the monument paleontology had priority over other uses. [But on BLM lands managed for multiple uses,] if there’s another competing use the paleontology does not necessarily hold sway. An extreme example would be mining—if mining wins out, then the fossils can be destroyed. “Second, the monument is better staffed, so it’s harder for someone to sneak in illegally and take things, whereas on ordinary BLM land it’s much less well policed. Nat Geo: What Monuments Have Shrunk? Previous Previous post: What Does the Ban on Russia from the Winter Olympics Mean?